Get the best credit card for travellers, and get RM100 AirAsia Electronic Gift Voucher off your next holiday - which can potentially offset your total airfare! 1. Apply any time from 3 - 31 December 2011. 2. Swipe your card 3 times with spend of RM300 within 2 months, upon card approval. Get RM50 cash back too when you apply today! Be in the know about AirAsia promotions 1 day before everyone else! Redeem Electronic Gift Vouchers for free flights and holidays. Over 340 gift items to choose from! Available for members only during special promotion periods. 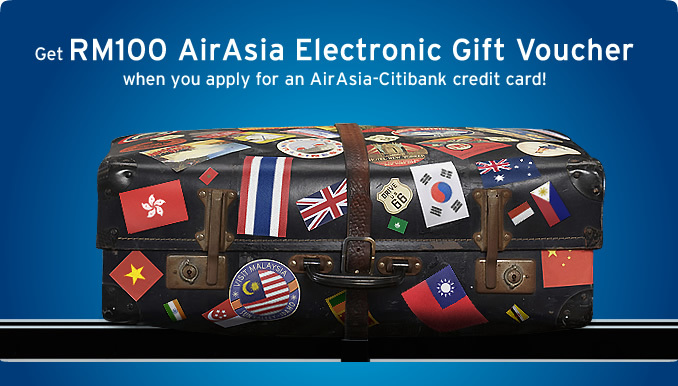 Click here to APPLY AirAsia-Citibank credit card NOW!